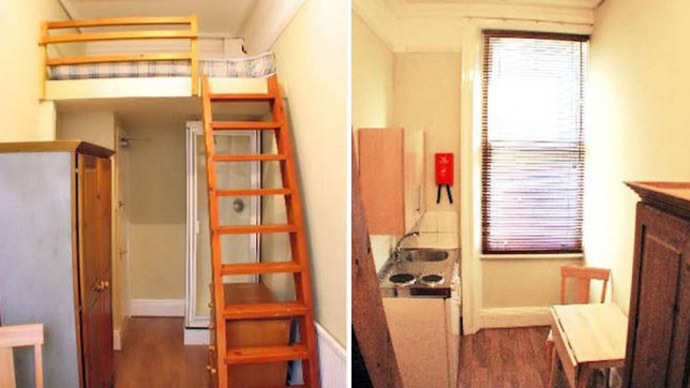 A “cozy” crib in a lavish West London district is up for grabs for a mere £520 per month, as long as the prospective tenant is prepared to wash under their bed. The studio apartment in question is situated on West Kensington’s upmarket Castletown Road. Bizarrely, this pinnacle of minimalist city-dwelling comes complete with a humble shower nested under a single bed. The mezzanine-style flat is also home to “a fully furnished living area,” including a kitchenette, table, chair, wardrobe and chest of drawers, an advertisement on British property site Zoopla boasts. However, the cramped flat has been derided by housing justice groups. “It is depressing to think that someone is willing to live there,” he told the Evening Standard. His scathing criticism of a housing market that serves London's elite follows ‘Homes for Britain,’ an event held in central London on Tuesday. Considered the largest housing justice rally in UK history, the event was hosted by Jonathan Dimbley and attended by as many as 2,500 campaigners. It was organized to address Britain's housing crisis. Among those who spoke at the rally were radical filmmaker Ken Loach and UKIP chief Nigel Farage. Farage and Loach’s proposed solutions to the crisis were radically different. Farage claimed slashing immigration numbers would taper demand for housing in Britain. But Loach proposed a far-reaching government building scheme similar to Aneurin Bevan’s in the 1940s, whereby builders, planners and architects were directly employed by the state. Addressing the crowd, Loach said “tens of thousands of families have their lives in chaos” as Britain's political establishment has watched on. The Homes for Britain event was supported by estate agents, developers, charities and social landlords. It called upon the next government to deliver a plan to solve the UK’s housing crisis before yet another generation is burdened with it. “This is one of the many signs of the chronic housing crisis currently facing our capital,” he added.